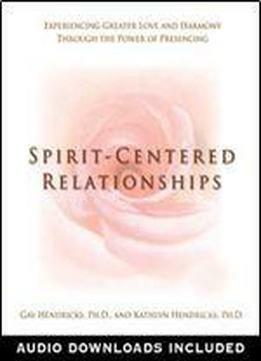 What is a Spirit Centered relationship, and how can you bring more genuine love into your life? To answer these questions, tune in to yourself to find out if this is what your heart desires in a close relationship: 1) You feel connected to your own spiritual essence-your true self-in all the ups and downs of daily living. 2) You and your partner feel connected on the spiritual level, both in times of stress as well as in times of joy and abundance 3) You grow creatively as independent individuals at the same time that you grow closer together in intimacy If this is the kind of relationship your heart desires, then we believe that you'll find this book liberating, practical, and soul satisfying.